The 2-in-1 tablet market has been getting a lot of attention thanks to the Microsoft Surface Pro 4. However, there seems to be a new monster in town and this is Samsung Galaxy TabPro S.
Both tablets run on the latest version of Windows 10 OS and there is no doubt that there are lots of similarities between them, ranging from specs to price tags. However, given that the two are very close rivals, there will always be some differences. 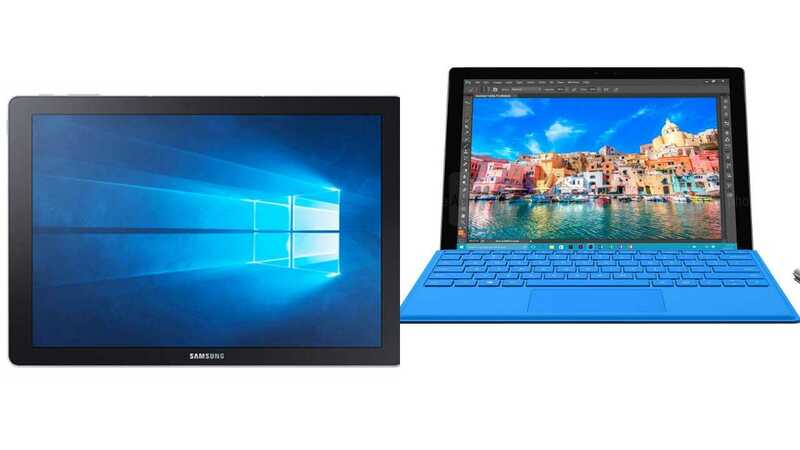 So, which one between the Microsoft Surface Pro 4 and Samsung Galaxy TabPro S is the best 2-in-1 tablet for you? When it comes to size, it is almost impossible to separate the two. 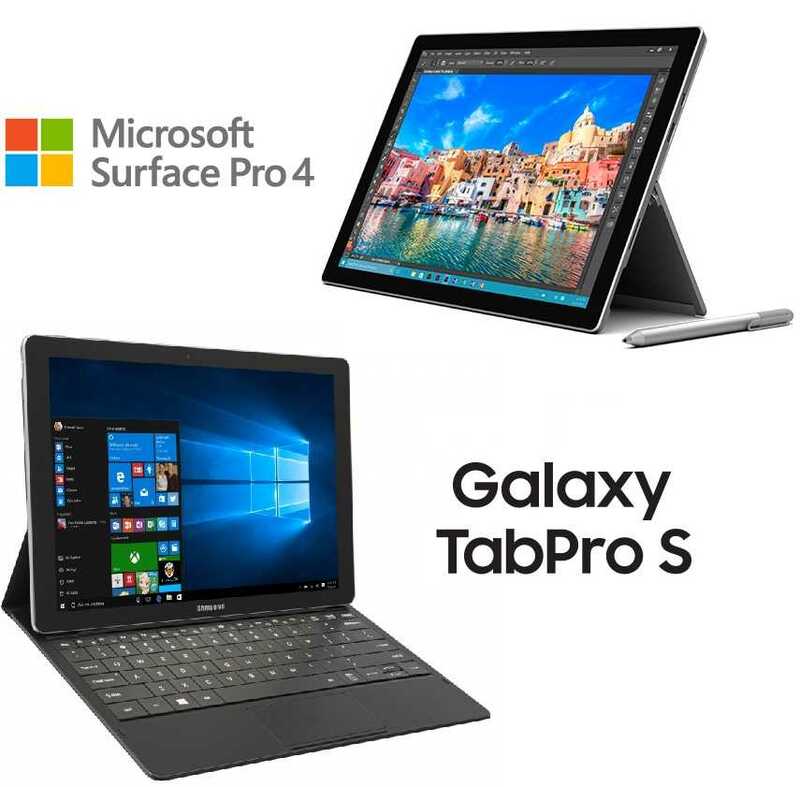 However, you will notice that the Galaxy TabPro S looks slightly shorter, is a bit lighter and slimmer as compared to the Microsoft Surface Pro 4. The former has measurements of 11.4 by 7.8 by 0.25 inches and weighs 1.5 pounds compared to the latter’s 11.5 by 7.9 by 0.33 inches and a weight of 1.7 pounds. To differentiate the two, Microsoft built a kickstand into the Surface Pro 4. This stand can be adjusted to different angles to fit the needs of the user. On the other hand, Samsung Galaxy TabPro S depends on its keyboard folio in order to access its stand. As a result, this will only give you two angles of viewing. On matters of display, the Microsoft Surface Pro 4 has a screen size of 12.3 inches while the Galaxy TabPro S’ is 0.3 inches smaller. You have to really put in a lot in order to tell the two apart when side by side. Even though the two are almost identical in terms of screen sizes, the Surface Pro 4 has a better resolution of 2736 by 1824 pixels as compared to 2160 by 1440 pixels panel used on the TabPro S. As a result, you will enjoy slightly sharper viewing on the Microsoft device (267ppi) as compared to the Samsung tablet (216ppi). Despite this, Samsung’s 2-in-1 tablet still produces magnificent displays with its Super AMOLED panel as opposed to the LCD panel used on the Surface Pro 4. It gets even better when it comes to battery power management. Speaking of batteries, the Galaxy TabPro S comes with a USB Type-C port meant for data transfer, charging and other accessories. On the other hand, Microsoft went for a full-sized USB Type-A port for the Surface Pro 4. This is only meant for data transfer and accessories. 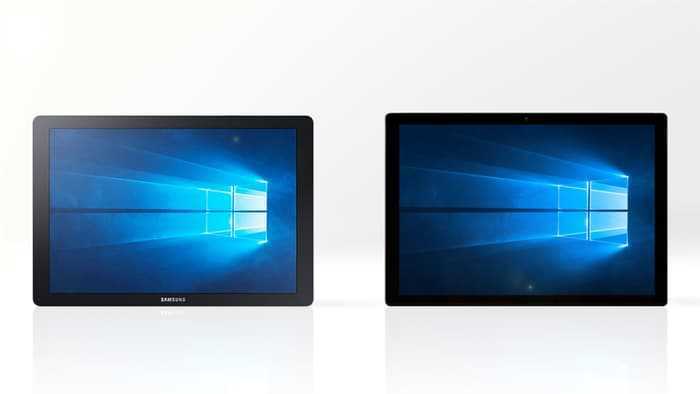 The tablet also features a proprietary power port as well as a Mini DisplayPort for connecting the device to a larger screen. Samsung put aside the microSD card slot on its tablet, but Microsoft included one on the Pro 4. The latter also comes without a physical button for opening the start menu on Windows 10, something the former has included on the right side. Both devices have a Pen, but it’s only Microsoft’s tablet that comes with the pen bundled with it. Those using the Samsung tablet will have to buy it separately. Microsoft Surface Pro 4 has ten different variants whereas Samsung Galaxy TabPro S has only one, at least for now. However, for comparison purposes, we’ll stick with the Surface Pro 4 variant that comes with similar configurations as the Galaxy TabPro S.
Both models are powered by 6th generation dual-core Intel Core M3 processors clocked at speeds of 0.9GHz-2.2GHz and are supported by 4GB RAM. On storage matters, both have inbuilt storage of 128GB, but as noted earlier, the Surface Pro 4 has a microSD card slot for expanding the memory. In addition, the two share the same graphics card. On software matters, Samsung Galaxy TabPro S users might get a variant running on Windows 10 Home or Windows 10 Pro version. The latter is meant for the business class. On the other hand, Microsoft Surface Pro 4 comes with the Pro version of Windows 10 on all variants. Of course, expect Samsung’s device to come with the OEM’s apps preinstalled on the device. Microsoft took things to the next level with the help of Windows Hello. The new tablet has a 5MP selfie camera that can also be used for facial recognition purposes, thus replacing the need of having a password for protecting the device. This is not available on Samsung’s device. On the rear, you will come across an 8MP sensor. On the contrary, Samsung built 5MP sensors on both the rear and front of the tablet. Samsung went for a massive 5200mAh battery unit for the Galaxy TabPro S. The Microsoft Surface Pro 4 is not bad either with its 5087mAh battery capacity. However, you will get even longer battery life with Samsung’s Super AMOLED display technology as compared to the LCD panels used on the Microsoft tablet. As far as pricing is concerned, the two devices cost the same ($899), however, this is only for the variants with Intel Core M3 processor, RAM of 4GB and inbuilt storage of 128GB. In the case of Microsoft Surface Pro 4 variants, each upgrade will require an additional amount of between $100 and $500.